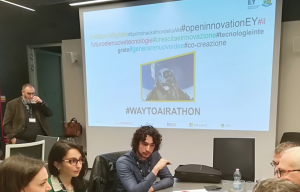 The ITAF Airathon represents not only a great opportunity to stimulate a broader reflection on the institutional interlocutors of the aerospace sector on complex issues related to logistics 4.0, but also promotes the knowledge of the cultural and technological revolution that is already underway. The Armed Forces launched the initiative to evaluate the impact of new technologies on the logistics processes of management and use of materials and equipment of aeronautical interest and, for the first time in the military, they made use of open innovation, starting from the development of 4.0 solutions to support its processes, to improve maintenance capacity and overall service levels. A selected representation of start-ups, industry experts from the Armed Forces and the national industry, as well as university students and young excellences of the country had the opportunity to work closely, putting together the different experiences in order to realize the best ideas and make them become possible operational solutions. The event, which is called “Airathon”, is the first hackathon to be carried out in Italy on the subject of logistics for the aeronautics sector, focused on two specific sectors: staff training and optimization of logistics processes through the implementation of new technologies.